Troops from 21 and 23 SAS, the elite regiment’s two reserve battalions, have been mobilised for operations on the Estonian border with Russia. The two SAS units are part of the 1st Intelligence, Surveillance and Reconnaissance Brigade, and have been deployed in Estonia for the past six months. It is understood that the troops are conducting Human Environment, Reconnaissance and Analysis (HERA) operations, where they monitor the movement of a potential enemy and analyse their intentions. The part-time troops are trained by serving members of the SAS and must all pass an extensive selection process. It is understood that in the event of a Russian attack on Estonia, the SAS troops would remain behind enemy lines where they would send back encrypted reports on troop movements. The SAS troops is also trained in using reconnaissance drones which are capable of spying on the Russian as they move along the Estonian border. The SAS reservists units are made up of civilians from various professions including barristers, accountants, architects and doctors, although their role is combat and life preservation. 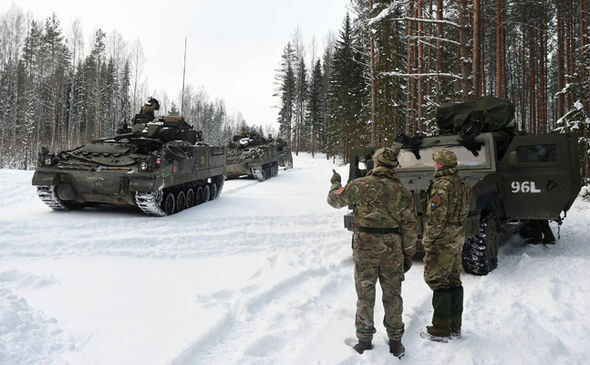 The troops can undertake voluntary mobilisation where they can be deployed in Estonia for several months at a time. During this period they will be paid as soldiers, although their jobs will be held open for them. One source said: “The SAS reservists are probably the best in the British Army, at least as good as regular infantry troops. They are especially trained in long range surveillance and reconnaissance missions. The regular SAS troops are busy in Iraq and Afghanistan so this highly important operation was passed on to the SAS reservists. but so were the SAS thats all they are i served alongside them in iraq and they were not as bad as the americans, but still just awful. When I imagine what the Brits are doing overthere, BTW they have nothing lost in Eastern Europe, and what there task could be in case SAS is infiltrating Russia (not invading!) I started really LOL. Why? It reminds me of the book “The spy who came from the Cold”. It all was a thick debacle or disaster for the Britis and in this case for NATO. Time to close down the boy scout club NATO and send everybody home with a nice pension. The money will be there for there will be no war and the rusty hardware in Eastern Europe can be sold as old iron. Worth a couple of pence for a ton rust. The Brits are up to something again like they tried with ex-spy Skripal to no avail. Maybe dropped SAS bunch in the Arctic signaled May they are getting very cold and hungry and ask for “where are the polar boots you promised to send us”. More bollox. Russia won’t attack. So if NATO attacks, Russia has clearly and openly stated that any attack on Russia will be countered by tactical nukes. If things actually get hot, we’ll never know the truth. Outside of corporate interests, they will kill the internet and social media.